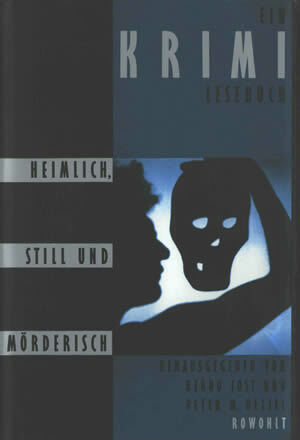 Reinbek bei Hamburg: Rowohlt Verlag, 1989. This is a crime reader published in 1989 by Rowohlt Verlag, which contains the Tony Hillerman short story, "The Witch, Yazzie, and the Nine of Clubs" (translated as "Tracks of a Werewolf" in German). The story was translated into German by Klaus Fröba. In this story, somewhat contemporaneous with People of Darkness, the newly assigned detective Jim Chee solves a mystery during a long evening attending a Navajo ceremony. This volume is edited by Bernd Jost and Peter M. Hetzel, and contains work by other American and European mystery writers as well as Hillerman. This is a hardcover book with a dust jacket and clear plastic cover. Binding: Full binding, black cloth-covered boards. A graphic version of the jacket photo is embossed on the front cover in silver. On the spine, the book title is embossed within silver rectangles, and the publisher name is in silver at the bottom.